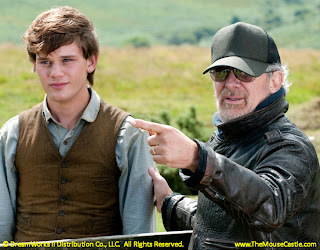 with Jeremy Irvine (Albert Narracott). Anytime you can get a glimpse at how Steven Spielberg goes through the creative process of making movies, it's worth the price of admission. Even if it doesn't involve one of his best films. That's not really a knock on the Oscar-nominated War Horse, producer/director Spielberg's latest live-action adventure available this week on Blu-ray, DVD and digital download. When your resume includes Jaws, Raiders of the Lost Ark and Schindler's List, your other works tend to pale in comparison. 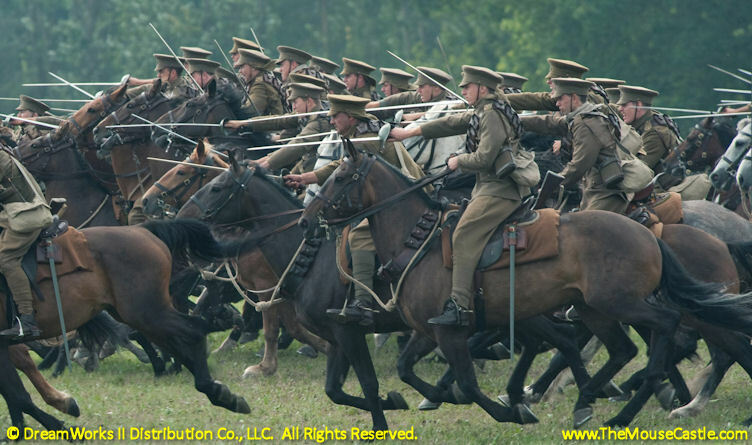 War Horse is a well-crafted film full of sweeping vistas that would do John Ford proud and intense war scenes every bit as harrowing as Spielberg's own Saving Private Ryan. It's saddled, however, with an improbable boy-meets-horse, boy-gets-horse, boy-and-horse-are-separated-and-endure-the-hellish-horrors-of-World-War-I, boy-reunites-with-horse story line. There are a few too many convenient twists of fate that take the courageous thoroughbred Joey from English moors to French battlefields and back again. There's also an overindulgence by Spielberg in every visual movie cliche at his disposal. There's not a dramatic rainstorm nor majestic sunset in War Horse he doesn't love. It's all beautiful and evocative, to be sure, but it's also old Hollywood film making by rote. It compels and entertains, but stops short of being truly inspiring. 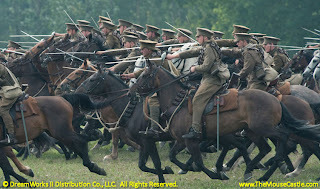 British soldiers charge into battle in War Horse. Still, there's plenty about War Horse to admire, from a thrilling and ultimately disastrous charge by British cavalry against a German encampment to a tense battlefield meeting between two enemy soldiers to save an injured Joey (if there's one theme to take away from War Horse, it's that it really sucked to be a horse in WWI). These scenes and many others are explored behind the scenes in the fascinating documentary War Horse: A Filmmaking Journey. This hour-long bonus feature on the 4-Disc Blu-ray Combo Pack takes you chronologically through select scenes, offering revealing insight into the making of the film. We get plenty of input from Spielberg's creative team, including producer Kathleen Kennedy and director of photography Janusz Kaminski, but the best moments belong to Spielberg, whether we're watching him on-set framing a scene or giving on-the-fly directions to his talented cast. It's watching the master at work and is the best thing to recommend about this Blu-ray package.